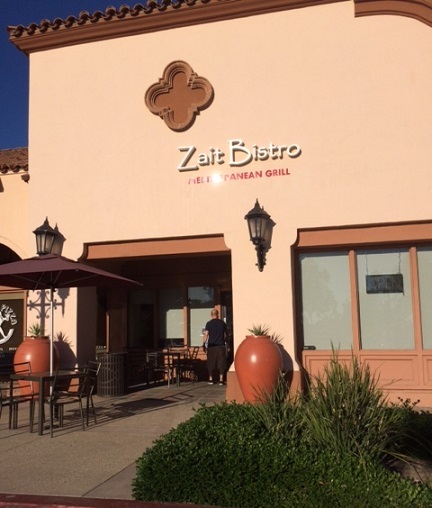 Located in Terra Vista Village, next to Stuffed Pizza and Ralphs and near a boba shop, Zait Bistro is a mom and pop Lebanese restaurant. A friend picked it for dinner based on online ratings and it sounded fine to me. 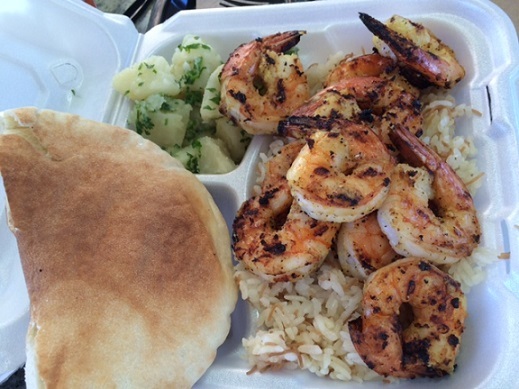 Zait’s menu has 10 combo plates of shawarma, kababs and falafel, which come with two sides and pita bread. They can be ordered in two or three sizes depending on the number of skewers or pieces you prefer ($8 to $15). They also have grilled chicken, sandwiches and salads. The woman at the counter let us try some of the sides, which were in small bins at the counter behind plastic. That was nice. It was like being at an ice cream shop, except we were trying Mediterranean salad, not mint chip. I ordered a small lamb kabab, with one skewer, plus tabbouleh and grape leaves ($10); my friend had two shrimp skewers plus potatoes and falafel ($15). We sat down to await our food. A sign on the wall cautions that “fresh food is not fast food” and gives the preparation time for each entree, up to 18 minutes. Our food arrived after what seemed like a typical wait, but the heads-up was appreciated, as was the concept of making our food to order. It’s served in foam containers, which isn’t much for presentation, but for those taking home leftovers, it’s handy. 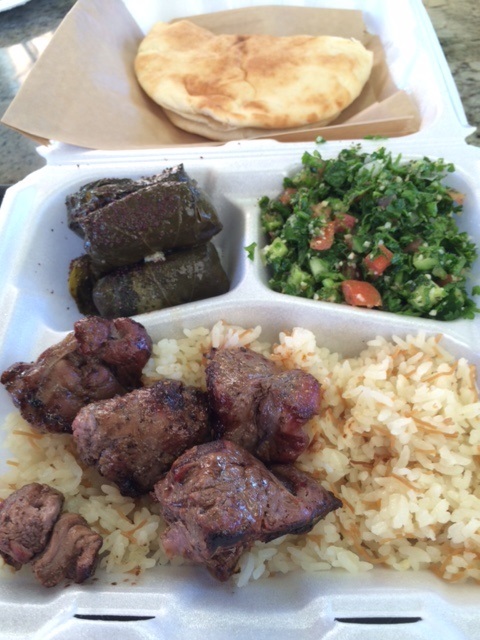 My lamb was very good, and one skewer was quite enough food, especially with the sides. My friend got about eight shrimp of impressive size. “This is a lot of shrimp,” she exclaimed. I was a little envious. She also praised her falafel for having more taste than the typical overly fried version. Zait has a Pepsi freestyle machine and Turkish coffee for 99 cents, plus baklava and harissa for dessert. I would go back. Zait is all right. 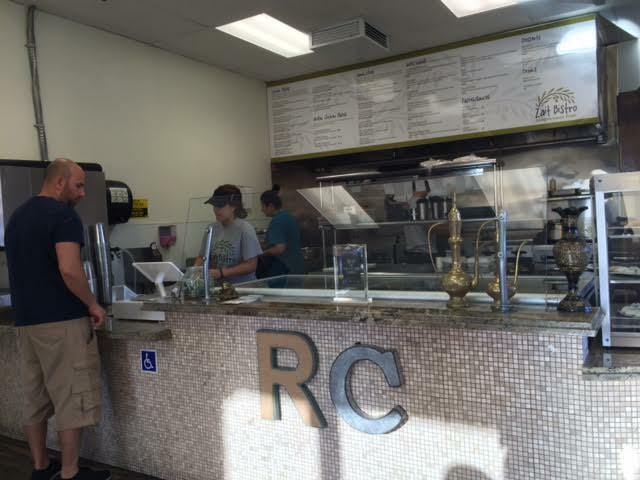 This entry was posted in Restaurants: Rancho Cucamonga and tagged Mediterranean, Rancho Cucamonga, restaurants by David Allen. Bookmark the permalink. Your food looks delicious! How did you like the tabbouleh? It looks like they make it as a parsley salad with a little bulgur. I learned to make it from my Armenian grandmother, and ours is a bulgur salad with a little parsley. Admittedly, when you eat it at a meal that includes rice pilaf, it’s a lot of carbs. But by itself it’s much more satisfying. I’m used to tabbouleh with a lot of parsley, and this was a good version of that. The flavor tends to be so sharp that a side-salad portion is just right. I think that’s because of the lemon juice. Our family adds tomatoes, which calms that tartness. I guess we all tend to prefer our family favorites! I think the shrimp may lead me to this place. Your friend’s pithy comment strikes at the heart of shrimp-lovers everywhere. What could be better than “a lot of shrimp”? “A fairly large quantity of shrimp” or “quite a few shrimp” pale in comparison!